Amazon EC2 Dedicated Hosts are servers with virtual machine capacity dedicated to one Amazon Web Services customer, instead of sharing server capacity with other customers. AWS customers use Elastic Compute Cloud (EC2) Dedicated Hosts to meet strict compliance and regulatory requirements or to preserve software licenses. 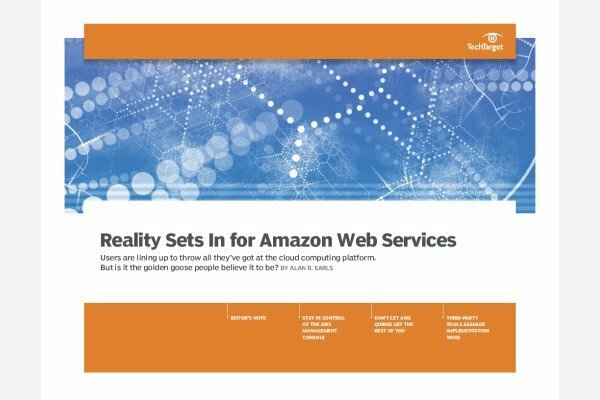 While Amazon Web Services (AWS) has established itself as a top contender in the cloud computing market, it's not without its challenges and misconceptions. Get expert insight into the most common and pressing questions regarding AWS management, monitoring, costs, benefits, limitations and more. An Amazon EC2 Dedicated Host differs from a Dedicated Instance in that it provides greater control and visibility of where and how compute instances are placed on a physical server. An administrator can consistently deploy instances to the same physical server until it's time to release it. Capacity for an Amazon EC2 Dedicated Host instance is available after an administrator allocates it within an account. An administrator or end user can launch instances using AWS' RunInstances API or the AWS Management Console. Instances are launched manually onto a specific EC2 Dedicated Host or automatically using EC2. Manually placing instances ensures they meet licensing, compliance, regulatory and tracking needs. An AWS user must choose an instance size configuration when allocating a host; all instances in a host must adhere to that size. The maximum number of instances allowed per host varies. Some software licenses allow enterprises to operate server-bound software in Amazon EC2 Dedicated Hosts, a policy called Bring Your Own License (BYOL). An AWS customer should verify license terms before importing machine images through the ImportImage API, which is available through AWS' VM Import/Export service. A user can view the number of sockets and physical cores for instances within a Dedicated Host, which helps manage per-core or per-socket software licenses. Once an image is imported, an administrator can launch instances from those images onto EC2 Dedicated Hosts. It's also possible to launch Amazon Linux and AWS Marketplace images into hosts. To release an On-Demand Host, an administrator must first use the ReleaseHosts API or AWS Management Console to stop or terminate all instances. EC2 Dedicated Hosts are purchased either On-Demand (hourly) or with Reservations (yearly, under contract terms). Reserved EC2 Dedicated Hosts are generally available for one- and three-year terms. Users can pay for Reserved EC2 Dedicated Hosts with full, partial or no up-front payments. Customers purchasing On-Demand Hosts are charged for every hour the host is active, regardless of how many images or instances are running. Using the AWS Config service, an administrator can track images, hosts and instances within EC2 Dedicated Hosts. Hosts can be identified using the Host-ID feature. The Host-ID remains with the physical server and cannot be swapped for another identifier. How do you tailor EC2 instances to meet your security needs? AWS EC2 is great for hosting your websites because it has auto scaling and better performance than other hosting types. But deploying website on AWS is quite complicated and time consuming unless you are using a managed hosting like Cloudways that makes it quick and easy to host application AWS. On the other hand, there is also Cloudfront, the CDN of AWS. It's really great.